You've landed your first library job--congratulations! All summer, you've looked forward to standing in the middle of your very own library, taking a deep breath, and reveling in all that library-awesomeness. point you in a direction, but now, you are it. A team of one. Uno. Solamente. Honey, we have all been there. This post was actually inspired by a question posted on Elementary Librarian's FaceBook page, as well as several similar questions I've seen recently on LM_Net. I can distinctly remember feeling overwhelmed, anxious, and completely alone in my first few days. 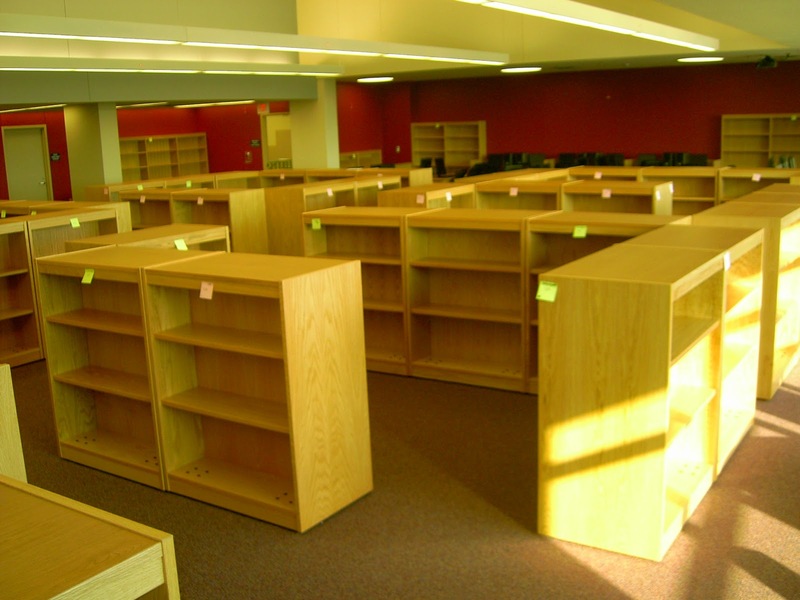 Back in August 2004, I was super-excited to become a librarian, but I was also five months pregnant, exhausted, and clueless about where to start in my brand-new school library. I didn't know who to ask or even what to ask. Hang in there--it will get better! 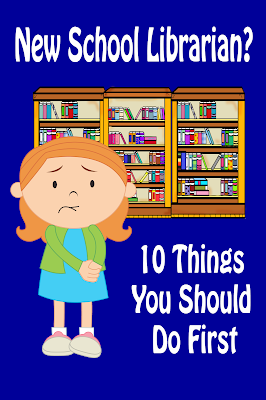 For now, here's a little boost: ten things new librarians should do first. Other than the first two, which really should be done before anything else, these ten "firsts" are not in any particular order. 1. Prepare yourself and your circulation desk for checkout. Prepare your circulation station. At a minimum, you need a computer, a circulation system, and a login. If you do not have these things, make it a priority to get them. Make sure you know how to do basic circulation tasks--checkout, check in, and search the catalog. Prepare a manual checkout system and be ready to use it if needed. Free equipment sign-out sheet shared by University of Washington-Tacoma Institute of Technology. Your library will change much in your time there, and you will want to document that. It's fun to look back at that weirdly-placed shelf you moved or that totally blank wall that is now a beautiful mural. Plus, you can use these photos later to show added-value or on a future job portfolio. If you are really feeling adventurous, take a video as you walk through the library, commenting on what you like and don't like. No one has to see it unless you want them to! 3. Find the library handbook. The library handbook may be difficult to find. It's probably in a binder, which may or may not be marked as "Library Handbook." 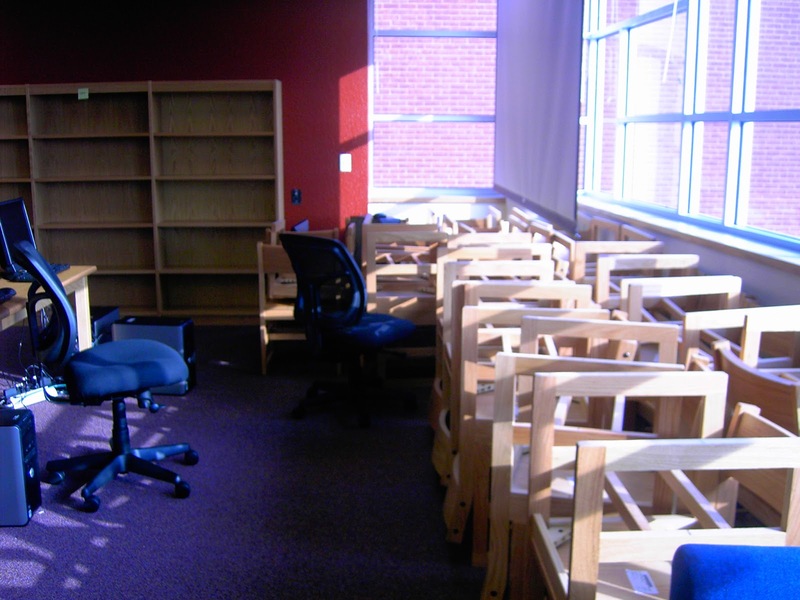 Look behind the librarian's desk area, around the circulation desk, and possibly, in the principal or vice-principal's office. If you don't find it, check the district website as it may be 100% online. Or it may not exist at all. I've seen huge variances in library handbooks, from nothing at all to a scant two-page document (seriously, why bother?) to a binder filled with more than 100 pages. Once you find the handbook, take it home and read sections on collection development, circulation policies (may differ from what's on the website), and procedures for challenged materials. 4. Start creating a tentative schedule. As you meet people, ask questions about library scheduling expectations. What was the schedule like last year? Did it work for teachers? Students? The librarian? Are you expected to offer a flex or fixed schedule? Who makes the schedule? Do teachers stay in the library with students, or are you on the specials rotation? Even if you are on a specials rotation with PE, music, and art, you still need to figure out when you will do administrative tasks such as shelving books, ordering new materials, cataloging, planning lessons, etc. If you are on a flex schedule, teachers will probably start scheduling flex time soon. Find or buy a blank calendar to use for scheduling flex time classes. When I worked in Texas, I used a freebie blank calendar our district and local business sponsors put together for teachers. At my current school, I use one of my school's student planners. If your district does not do either of these, you can print calendar pages online or just buy a one from your local dollar store. Chances are, your school is located within a school district or other network of related schools. You are going to have lots of questions, and it is important that you have someone you can discuss these with. Pick a librarian nearby and reach out. Send an email, call, schedule a short visit (bring cookies!). If the person you picked doesn't seem receptive (they are busy; it's probably not personal), just pick someone else. Do not wait for the district to assign you a mentor or for someone to approach you. They won't. 6. Investigate your library computers and printers. Are they hooked up? Do they work? Can the computers be used to search the library catalog? What should you do when there is a technical issue? How are the computers used within the school? If you are responsible for laptop trolleys or a library computer lab, start thinking about how you want to schedule their use. Is there already a system in place? Like checkout, some teachers will want to claim computer lab or trolley use pretty early in the year, possibly even before school starts. I have been in charge of both a lab and trolleys, and let me just tell you right now, you will go nuts if you don't have a reliable, consistent system for booking. Find out what's been done before and how it worked or didn't work. Computer booking can be a very touchy issue, and it will drive you crazy every now and then, even with the best booking system in place. Check out my post on 22 tips to help you manage computer labs and trolleys. 7. 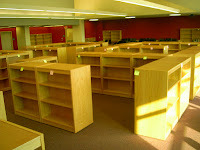 Examine the library layout. 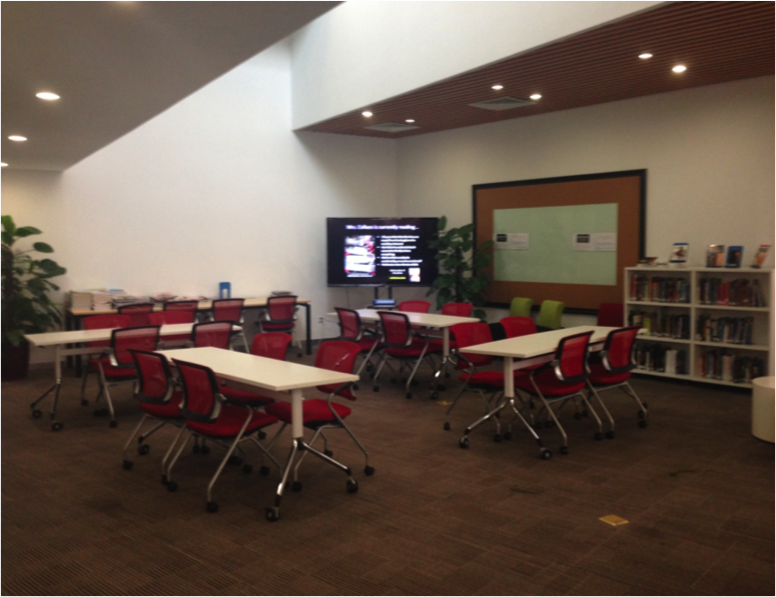 When I started at my current library in 2014, I was surprised at how unusable my existing presentation area was. There was a screen, but it was so high up that I could not reach it to pull it down. It appeared to have had a remote control at one time, but no one knew where it might be. I dug up a computer projector in the library office, but no electrical outlets existed where I needed them. I had no cart for the projector, so I had to place it on top of a nonfiction shelf. There were cords dangling everywhere because I had strung extension cords across the library due to no outlets. There was no audio available, so more cords were added to set up speakers. Once I got the projector going, it became clear that there was way too much natural light in the area. After about 9am, the sun streaming in from our skylights and two walls of windows completely drowned out the projected image. What a mess! Within a few months, I had experimented with different areas of the library to combat that bright natural light. The solution came in my asking for (and getting!!!) a 70" flatscreen on a cart that would be permanently housed in the library. It had its own speakers, and natural light didn't obscure the image. If your area doesn't work no matter what you try, speak up! It turned out that my school just happened to have that beautiful flatscreen sitting in storage. It was still in the box! 8. Review existing circulation policies. What is the checkout period? How many books can students, teachers, and parents checkout at one time? What happens when books are late? Damaged? Unless you are starting a brand-new library, you should be able to find these policies on the school or district website. The vast majority of teachers will be thrilled to have you at their department meetings. Attending these meetings regularly shows that you care about what's happening in the classrooms and that you see the library as an extension of the classroom. You don't have to say anything much at the meeting; in fact, the less you say the better. Go to listen, to take notes, to learn who's who, to introduce yourself. Listen well, and you will learn much about what the teachers need from the library and what you can do to support them. 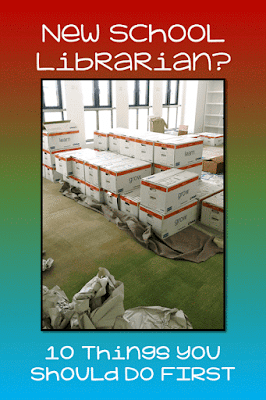 LM_Net is a gigantic, free email listserv of all types of librarians across the globe. Topics of discussion range from circulation policies, copyright questions, curriculum, IB support, cataloging, bibliographies, book reviews, job postings, and more. I love LM_Net!!! Joining is as simple as sending a blank email, and you can choose how many emails you receive. A word of caution: If you choose to receive all LM_Net emails, you will get a lot of email every day. I probably receive 30 or more emails every day from LM_Net. I enjoy my LM_Net emails now, but when I was a new librarian, I found the full listserv to be so overwhelming that I canceled my service for several years. I advise new librarians to start with the digest version, which will limit the number of emails you receive while still allowing you to post questions to the group. Though it may sometimes feel like it, you are not alone. If you have questions, post to the group! You will get lots of support and answers to your questions, and you'll probably make some new friends in the process. Don't be shy--we want to help! Thanks, I wasn't aware of LM_Net! Just joined. I also "liked" the FB group for elementary librarians. Glad to introduce you to both--you will love them! I'd love to see your post on scheduling device carts and computer labs. I'm looking for some new idea. Hi, Deirdre--I'm actually planning that one out right now. Stay tuned in the next few days! Thank you so much for this list... and for remembering new librarians. I SO appreciate your willingness to share. Have a great year! So beneficial. I am no longer a brand new librarian, but, I really think these tips would have helped me and may even work for me now. So great. Thank you! Thank you so much for this article! I am the new librarian at our school this year. The old librarian had been there for 30+ years, so I have some big shoes to fill! The description above is how I feel right now. However, my biggest challenge is that I am changing things around and I am hearing from some of the established teachers "Well, that isn't how how (old librarian) does things." So it's understandable, but frustrating at the same time. Oh, I remember these days! When I opened my school mentioned above (my first library), there had not even been a previous librarian. But that did not stop many, many people from saying, "we did it this way at my previous school." Take what you can from what they say (there may be some good in there), but pave your own way. Change can be hard--they'll come around! Hi, Irene! I would start by deciding on genres and colors. Order your labels (Tainao has tons, really cheap). And then just start labeling! For ordering, I mainly use Follett and Obido Books (based in China--they rock!). Email me at leigh[at]readerpants[dot]net, and I will send you Taobao links for labels and other materials, plus the contacts for Follett and Obido in China. This is very helpful. If I may add..You can also do the inventory of library materials and come up with a report. In that way, you will become aware of the collections and what's been turned over to you. You'll be able to know if there are losses or damages or missing collections. Thank you for the advice. I just started my career as school librarian and your advice is very helpful. Thanks for this useful advice for new librarians, media specialist, or as they call me the METI (media and educational technology instructor.) It would have been great to find this earlier. I came into a school that had had 5 other librarians/people running the library over the last 5 years (including a parapro and parent group.) It was a mess. Over half the books in the system were lost and they have me teaching technology classes on a fixed schedule. I had to hit the ground running. It was very stressful. Plus nobody knew the passwords! waoooo... I am so happy to find this article here... I am I new librarian in my school... as a matter of fact this is my first time of doing library job.. I just finished my Diploma in library and information science last year December 2016... the library has never be handle by a professional librarian or anyone that have study library science... as it is now im just confuse not knowing what to do or where to start in putting things in place... please guys I really need your help in other to get started... the materials are not catalogued, which they don't have technical section for cataloguing... and thanks for the LM-Net link.. I would love to have more links to enable me get through of with my profession... here is my mail for anybody who has more link to please send to me.. I appreciate you all.. This is my first time to be a Librarian.. And I really don't know what to do.. How can I get in to LM-Net link? Hi, Ruth! Welcome to the best job in the world! For LM_Net, you can subscribe here: http://www.lm-net.info/subscribe.html. Know that you will get a lot of emails if you subscribe to the Classic version. That will send you emails in real-time and could get overwhelming. I do the Classic, but just letting you know. To minimize the number of emails you get, subscribe to the Digest version. Both versions can be found at the link posted in this response. This is a huge question, but one I am sure many new librarians have. Are you on Pinterest? There are loads of ideas there for all kinds of library programming. I would definitely start there. Hang in there, Keegan! It will get easier, I promise! THANK YOU for this post! I'm a new librarian and I'm stressing out like crazy! As far as I can tell, the high school I work at does not have a library handbook. I'm the sole librarian, and am only a paraprofessional, so I have no library degrees. I'm learning everything from scratch and mostly on my own as I believe there was a bad parting of way with the last librarian, as I've never been advised to contact her, nor has the 'higher ups'. I think I'm doing pretty well so far, but a handbook would have been awesome as a starting guideline. I'd like to make one up, but I haven't a clue what should be in it. Could someone help me out with that? It'd be greatly appreciated. Thank you for this post. I found it very informative. I am very excited about becoming a teacher/librarian. Thank you for this information. Very helpful for me as an assistant running a huge new library with grades 6-8, a computer lab next to the library and 2 computer labs on the first that I oversee and schedule along with 6 computer carts plus 1 that stays in the library. Scheduling is definitely important but at times it can get hectic. Moving in the library books coming from the different schools is the most challenging of all but we are getting there. 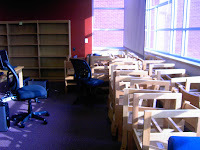 Is there anything else that I need to know in regards to the continuing setup of our school library? Thank you for all this information!! It is incredible usefull. I will be a new school librarian and all your shared worked is amazing!! I will read your post as a religious code (or something like that)!! This article is just too good.I am new Librarian to IB school. Really this article has helped me to motivate me a lot and I can now think of my initiatives which will help me as a Librarian.